I have been having a serious love affair with my panini press this past weekend. After getting inspired by some deliciously fattening panini recipes I found at Fine Cooking.com, I spent a lot of time playing around with some ingredients and coming up with some lower calorie versions of yummy new WW Sandwich Recipes! My husband didn’t mind the affair because he got to chow down on all my “experiments”. One of my favorites was the Turkey and Provolone Panini with a Chipotle Mayo Dressing. OMG, just thinking about that sandwich again right now has me getting all hot and bothered…. The key was keeping all the ingredients as light and low calorie as I could so that I could splurge a bit on the dressing, because really, who doesn’t like mayo? I also used a bit of nonfat plain Greek yogurt in the dressing mix so that I could bulk up the amount that I used ( I LOVE a LOT of dressing) without cranking up the calories and fat like mayo does. 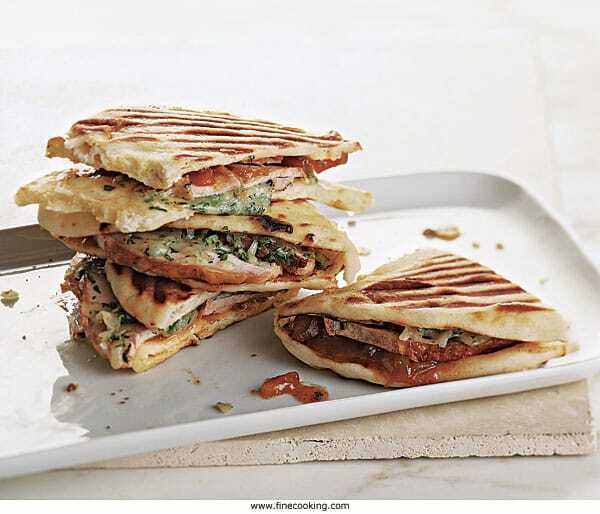 The end result was this delicious, low calorie panini recipe that would make a great dinner or healthy hot lunch idea! Enjoy! 1. Combine mayonnaise, yogurt, chipotle seasoning, basil, lime juice, salt and pepper in a small bowl. Spread about 2 teaspoons of the mixture on each slice of bread. Divide cheese slices, turkey, red peppers and tomato slices evenly among 4 slices of bread; top with the remaining bread. 2. If using a Panini press, just heat it up and place your sandwich in the press and close. Cook until all the insides of the sandwich are hot and cheese is melted. 3. If you are not using a Panini press, just spray a large nonstick skillet with non fat cooking spray (I prefer Pam Butter Flavored for this) and set over medium heat. Place 2 paninis in the pan. Place another medium skillet on top of the paninis, then weight it down with some large/heavy canned goods. Cook the paninis until golden on one side, about 2 minutes. Reduce the heat to medium-low, flip the paninis, replace the top skillet and cans, and cook until the second side is golden, 1 to 3 minutes more. Re-spray the pan and repeat with the remaining paninis. Hey I did this recipe and it was really great! The one thing I did differently is use 1/4 avocado instead of the mayo. Sam number of points but I think you get a little more bulk with the avocado. I will definitely try more of your recipes! Stumbled upon this site and I'm glad. I've been searching for other sites to keep Weight Watchers interesting. This recipe looks so good I want to lick the computer screen, lol.